You designed a wonderful collection in the theme of Chinese zodiacs – Why are you so fascinated by this? Isn’t life wonderfully strange that way? I grew up in a tiny village in Groningen – this place was far from exotic. Chinese zodiac first came my way when i was eighteen. I was at a modeling job and the make up artist with whom I worked told me I was a Tiger. So that was my coming out! It was a revelation to learn so much about myself and my place in the world. To commemorate that moment, I had a tiger tattooed on my wrist. As a constant reminder of my Tiger traits (the good and the bad), Tigers tend to get distracted quite easily, and the tattoo also serves as a gentle reminder to not lose sight of my goals. Fast forward to summer 2011. I was living with my family in New York. One sunny afternoon, after spending the day in the park, we ended up getting the kids hot dogs at a hot dog stand next to the Pulitzer fountain. In the fountain stood a circle of twelve giant bronze fountainheads, by artist Ai Weiwei, representing the twelve animals from the Chinese zodiac. Was it because of that magic afternoon, when our boys were still so little and happily exhausted from a full day of play, or was it because the sun can really cast a magic spell over Central Park? 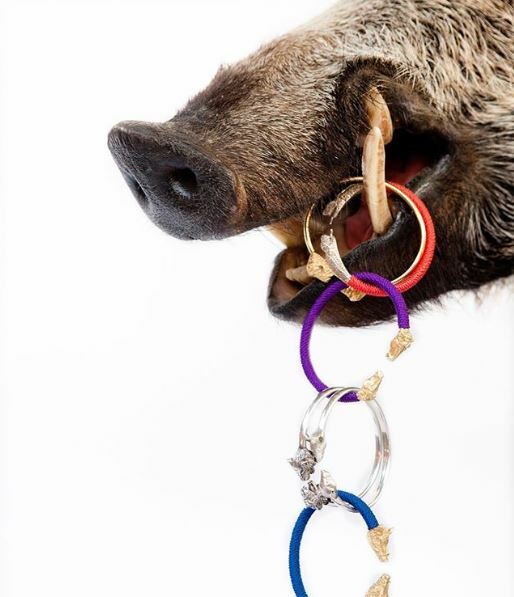 I don’t know but I did fall in love with these animals right there and decided to create a jewelry line around them. In fact, if you look closely at my Tiger, you see a resemblance with the Tiger form Ai Weiwei’s fountainhead animals. The Pig is the twelfth zodiac animal. There are many myths about these animals and their order of appearance. According to one, the Jade Emperor said the order would be decided by the order in which they arrive to his party. Pig was late because he overslept. When he arrived, he was the last one and so took the twelfth place. In Chinese culture, pigs are a symbol of wealth, with their big ears and chubby faces. As for me I’m very much looking forward to the Pig year! Prosperity and abundance will come to those who work hard. A few years ago you sold your company and now you bought it back….tell us more…. Well that’s a simple story, I needed the money. Buying it back though, that was something else! I had never imagined being so happy to have ‘my’ animals back. I am very grateful. It really feels as if I belong to those animals and they belong to me. Funny thing is, I always believed that if it was meant to be, I’d have them back one day and here we are. Now let’s get to work and profit from all that Piggy goodness that 2019 has in store for (all) of us! Soon it´s Chinese New Year – why is this bracelet the perfect gift? The Chinese Zodiac is said to influence your fortune, from matters of the heart to daily decisions. Each of the twelve animals has its own magical personality, so by wearing your inner animal on your wrist, you empower each characteristic and embrace your destiny! How’s that for a reason? :) Besides that, they’re just plain pretty ánd manufactured in The Netherlands which makes it an ethic choice as well. 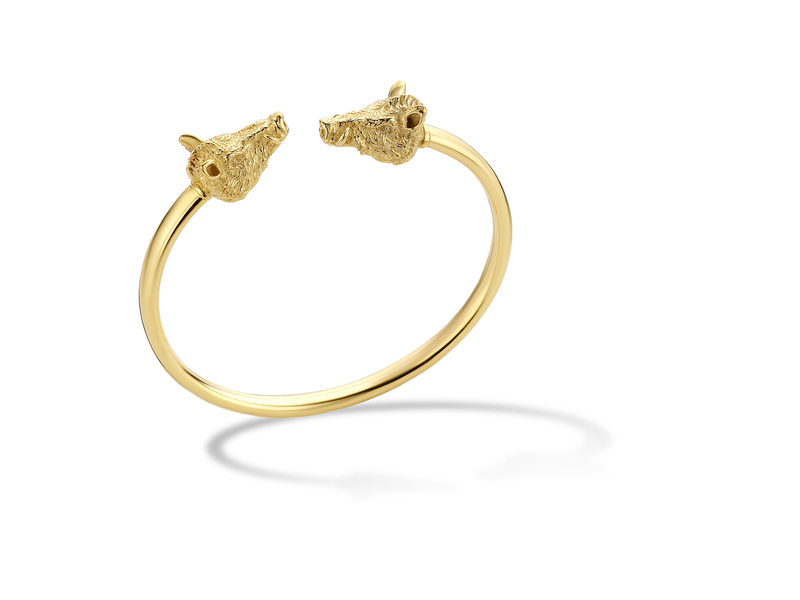 Can I wear a zodiac when it´s actually not my zodiac? Ha I love this question because i get it a lot! Well of course you can! I believe all animals serve as teachers. They help guide and protect you on your journey and you can be playful with that. It is not everyday you wake up as a Tiger. Some days I feel I can best study Rabbit or Sheep, for graciousness and softness of soul. Some days you need Ox’s medicine, for getting things done. In Chinese zodiac, each animal plays its part. No animal is better or lesser than the other. And they all need each other. That is the true beauty behind these beasts. Practitioners of Chinese Astrology consult traditional details and compatibilities to offer guidance in life for love and marriage. How do you feel about this? What is your best match in zodiacs and is it true in real life for you? Dogs and Horses are among my best friends, we are easy companions that make a lot of fun together. However! I’m dating a Snake. Hmmm..The ancient Chinese did not have a lot of pleasant things to say about this match. Stray form the Chinese lunar calendar though and check the sun signs and things are looking much brighter for us! Which zodiac are you most fascinated with and why? Rats have an exceptional sense of smell, did you know that? They’re being used to track down early stages of tbc. Detecting tuberculosis remains one of the biggest challenges facing medical professionals. Rats can check a hundred samples for tbc in twenty minutes, the same task would take a lab technician up to four days. Rats are also being used detecting landmines. They ignore scrap metal and only detect explosive scent, making them much faster at finding landmines then detectors. Isn’t that incredible? The Rat is definitely not getting the love it deserves! Looking for the perfect gift to a loved one or just simply for yourself? Head over to the website and discover the magic. From € 249 for sterling silver. From € 349 for 18carat gold vermeil to € 1990 for solid 14 carat gold.